Riverside General Hospital: Welcome to Riverside General Hospital. Riverside General Hospital (RGH) is a community-based non-profit acute care facility that provides Inpatient and Outpatient hospital care to the citizens of Harris County, parts of neighboring counties and the City of Houston. We are a 88 bed Acute Care facility with 100 plus beds in our Residential Care facility. Riverside General Hospital provides medical and rehabilitative care for its patients. We are committed to providing high-quality, comprehensive patient care that is designed to meet the total needs of our patients. RGH functions as a catalytic force in upgrading the health of the community through an emphasis on health maintenance, education and rehabilitation as well as diagnosis and treatment. In furtherance of its mission, Riverside General Hospital is committed to the concept of systematic, objective self-assessment for the purpose of continuously improving the quality of overall patient care. 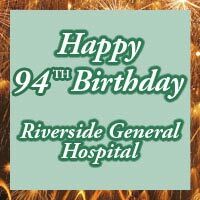 For more than 96 years Riverside General Hospital has acted as a leader in offering quality medical care for families, friends, neighbors and visitors. Our hospital, physicians and staff continue to combine their medical expertise, talents, and dedication to care for our #1 priority which is You! We appreciate you and we take comfort in knowing that you will continue to trust Riverside General Hospital as you local and community based hospital to care for you and your love ones. Please take a moment to explore our website in order to learn more about Riverside General Hospital, our physicians and the services we offer. Let our website be your premiere source for information that can offer answers regarding your health or the health of a loved one. Remember The Best Compliment You Can Give Is The Referral Of A Loved One! "I've never seen the client as stable as he has been since attending this program." "Hospitalizations have been reduced by 40% since our clients have been attending this program." "I've known this client for years and I've never seen him stick to any other program before the way he has this one." "I like this program, its small and personal. Clients get individual care and don't get lost in the shuffle." "This program is helping him get his life back on track."